A very beautiful plant with large vibrant rose-pink, broad-petalled flowers for a long season. 60cm. high. Really nice new dark red variety. Very floriferous , good compact habit, makes an ideal front of border plant. For sun or part shade. 50cm high, for good rich soil, not for very dry sites. Large pure white flowers tipped green, for a long summer season. Fantastic for lighting a shady area. 70cm. high, for sun or shade, avoid really dry sites. A selected form of 'Japanese Painted Fern' striking silver leaves with contrasting maroon veining. 30cm. high. Full or part shade. Slim spikes of soft indigo blue lupin-like flowers in early summer. Attractive black seed pods. 150cm. high. Vigorous form, denser,longer deep blue flower spikes during summer. Prefers fertile soil in sun, 90-120cm. high. New cultivar producing a gigantic mound of enormous silvered leaves, sprays of blue Forget-Me-Not flowers in spring and early summer. For part shade, 35cm. high. 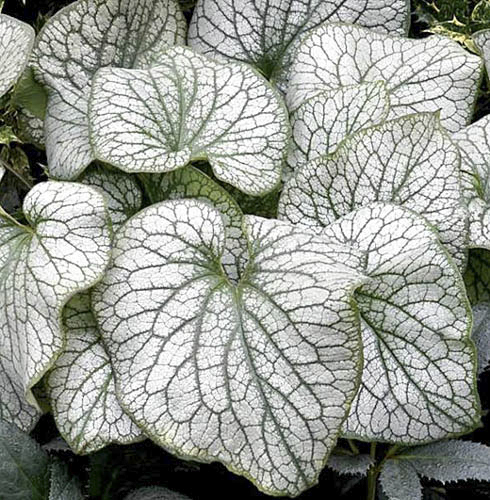 Dramatic silver frosted leaves veined & edged with green. Sprays of blue forget-me-not flowers in early summer. 50cm high. Fantastic cultivar producing masses of white forget-me-not flowers over beautifully marked silver and green foliage. 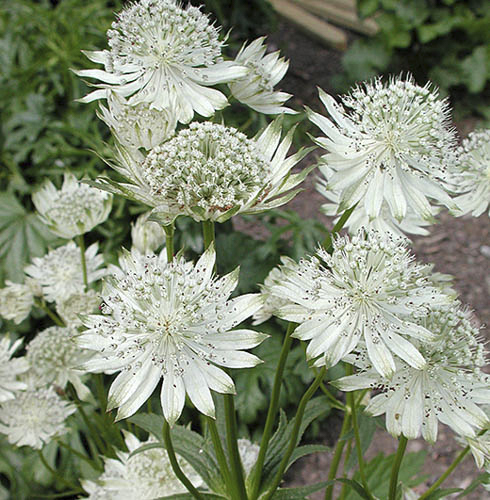 Vigorous clump-former, easy in part shade and fertile soil. 40-50cm. high. Collection of 6 Campanulas £30 + p&p. Campanulas are the very essence of the English flower border. They are breathtakingly beautiful in association with old shrub roses and other herbaceous plants, providing colour and interest from early Summer onwards. Enter 6 (or more) in Qty box.